NSDL came out with FVU version 4.0 and 2.136 on 25th September 2013. It needs to be seen how one treats a situation where there are no transactions in a quarter. As per Section 194LD, introduced in the Finance Bill 2013, TDS @ 5% needs to be deducted on interest payments for Rupee denominated bonds issued by the Government of India or any other Indian company. Pursuant to the change in this FVU, Correction Statement may be filed, only, if there are any changes in the existing Challan or Deductee or in case a new challan has been paid. The Finance Bill 2013 has introduced a new section 194-IA providing for TDS @ 1% to be deducted by purchaser. In case valid PAN of seller is not available , tax deduction will be at higher rate of 20%. This is applicable w.e.f June 01, 2013 for sale of immovable property ( other than agricultural land ) where consideration is Rs. 50 Lacs and above. The purchaser is exempt from the obligation to obtain TAN, which is otherwise mandatory for all deductors. CBDT has issued Notification No. 39/2013 on 31st May 2013 amending rules to simplify procedure for complying with provisions of this new section. 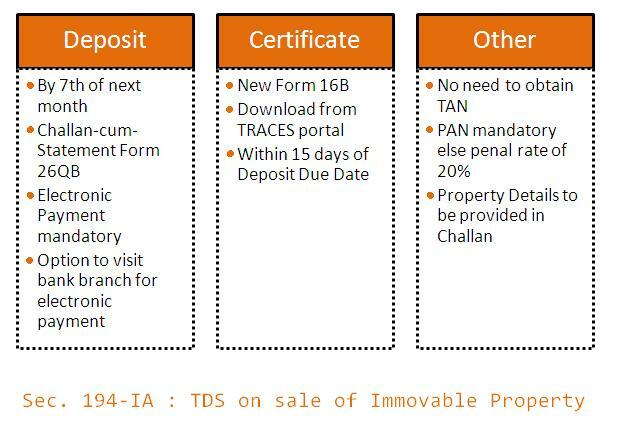 Since Section 194-IA transactions will be one off and deductor may not have net-banking facility, an alternate has been provided. The deductor has to fill the information online and then opt for e-tax payment on subsequent date option. On completing the form, an acknowledgement will be generated. The deductor can then visit a bank branch for payment, provide the acknowledgment number. Deductor must be very careful in filling up PAN details. Today is April 7 and as a deductor you must be planning to deposit TDS for all payments made during March 2011. Hold ! the rule has been changed and now the last date of deposit for such transactions is April 30. For non government deductors , earlier tds on all payments made during March was to be deposited before 7th of April. For all provisional entries credited on 31st March, the last date of deposit was 31st May. Above Notification amended rules pertaining to deposit of tax, issue of tds certificate and filing of eTDS statement. (1) All sums deducted in accordance with the provisions of Chapter XVII‐B by an office of the Government shall be paid to the credit of the Central Government ‐ (a) on the same day where the tax is paid without production of an income‐tax challan; and (b) on or before seven days from the end of the month in which the deduction is made or income‐tax is due under sub‐section (1A) of section 192, where tax is paid accompanied by an income‐tax challan. (2) All sums deducted in accordance with the provisions of Chapter XVII‐B by deductors other than an office of the Government shall be paid to the credit of the Central Government ‐ (a) on or before 30th day of April where the income or amount is credited or paid in the month of March; and (b) in any other case, on or before seven days from the end of the month in which‐ (i) the deduction is made; or (ii) income‐tax is due under sub‐section (1A) of section 192.